Here's another e-book reader with built in PDF support, something the Kindle 2 doesn't have. At a lightweight 5.3 ounces, Bookeen's latest portable device packs a sharp resolution of 200 DPI. Though pocket-sized, the Opus features a pretty standard 6" display. The 1GB of flash memory can accommodate ePub, PDF, HTML and text formats. 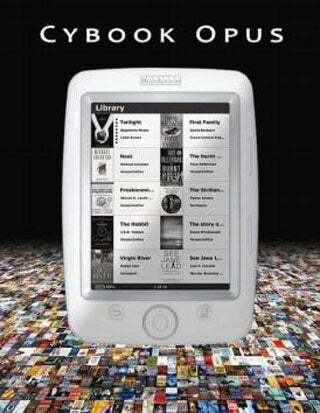 It has access to a catalog of 150,000 book titles from several retailer web shops, including Mobipocket ebooks. The battery life is reported at 8,000 page flips, though I'm not sure how that compares to the Kindle. At any rate, the device is good for 21 days at standby. Also worth nothing is that the Opus lacks the Kindle's 3G wireless feature, which somewhat undermines the portability aspect that Bookeen is pushing. However doing away with that feature is sure to save big on cost.